Note: We will be referring to the flow of current that is relative to the positive charges (i.e. conventional current) in a circuit. Diodes only allow current to flow in one direction, and they're always polarized. A diode has two terminals. The positive side is called the anode, and the negative one is called the cathode. The diode circuit symbol, with the anode and cathode marked. Current through a diode can only flow from the anode to the cathode, which would explain why it's important for a diode to be connected in the correct direction. Physically, every diode should have some sort of indication for either the anode or cathode pin. Usually the diode will have a line near the cathode pin, which matches the vertical line in the diode circuit symbol. Below are a few examples of diodes. The top diode, a 1N4001 rectifier, has a grey ring near the cathode. Below that, a 1N4148 signal diode uses a black ring to mark the cathode. At the bottom are a couple surface mount diodes, each of which use a line to mark which pin is the cathode. Notice the lines on each device, denoting the Cathode side, which match the line in the symbol above. LED stands for light-emitting diode, which means that much like their diode cousins, they're polarized. There are a handful of identifiers for finding the positive and negative pins on an LED. You can try to find the longer leg, which should indicate the positive, anode pin. Or, if someone's trimmed the legs, try finding the flat edge on the LED's outer casing. The pin nearest the flat edge will be the negative, cathode pin. There might be other indicators as well. SMD diodes have a range of anode/cathode identifiers. Sometimes it's easiest to just use a multimeter to test for polarity. Turn the multimeter to the diode setting (usually indicated by a diode symbol), and touch each probe to one of the LED terminals. If the LED lights up, the positive probe is touching the anode, and the negative probe is touching the cathode. If it doesn't light up, try swapping the probes around. 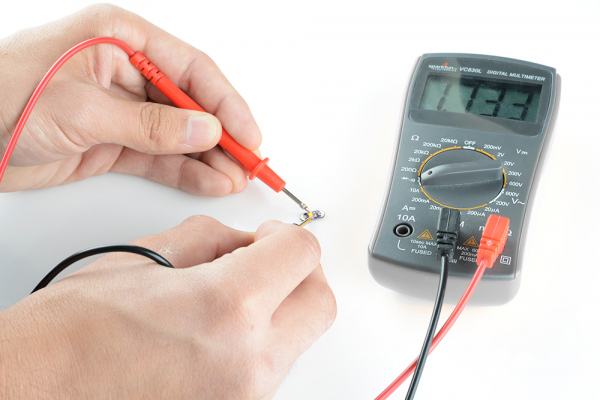 The polarity of a tiny, yellow, surface-mount LED is tested with a multimeter. If the positive lead touches the anode and negative touches the cathode, the LED should light up. Diodes certainly aren’t the only polarized component. There are tons of parts out there that won’t work if connected incorrectly. Next we’ll discuss some of the other common polarized components, beginning with integrated circuits.